So Oren is currently obsessed with animals at the moment and due to the fabulous spring weather we’re having and a rare day off for Mark last week we thought an indoor trip would be a good call. St. Andrews Aquarium isn’t too far from us, it’s just under an hour in the car and it’s by the beach so we thought we’d try and make a day of it. In the car on the way we talked about what animals we wanted to see and which we were most looking forward to seeing. The aquarium didn’t disappoint. There were two quiz sheets available, one aimed at older kids, where they had to answer questions by reading the info on the exhibits and one quiz sheet aimed at younger kids, which was a tick once you spot a certain animal type list. Perfect for Edward aged 7 (almost 8!) and Oren aged 6. We took one of each. Our smallest Loki (aged 2) was able to walk about freely and as the aquarium had just opened it was fairly quiet. He had lots of space to investigate the tanks and he was able to get right up close to the exhibits and all the animals. The first tanks as you walk in are really impressive. The boys could all get right up to the glass and have a good nosey. Loki was mesmerised and so excited he literally squealed with delight every time a fish moved. It was a very noisy 10 minutes to begin with until the novelty wore off! Oren got completely freaked out by the dwarf crocodile. It was hilarious, I have to agree the eyes in particular were especially disturbing – they really did seem to look right through you. Oren also totally missed the fact that there was a second crocodile in the tank and when it suddenly started to move with impressive stealth he practically climbed up me in a mixture of fear and hysterics. Edward really enjoyed the quiz and wandered off a couple of tanks ahead of us at a time so he could read the info and try and work out the answer before we caught up. The terrapins were a big hit as there was so many of them. They all moved really quickly and followed you if you put your hands on the glass. It was also a life lesson in cannibalism for the older two boys as there was a dead one rather disturbingly being eaten in the centre of the tank! Edward is still annoyed I wouldn’t take a picture of that! There were lots of mini tanks towards the end of the first floor, including some really funky crabs and lobsters. Oren spent ages trying to find the hidden and camouflaged creatures. He was amazed how well some of them managed to disguise themselves as rocks and remain so well hidden. We were then able to go outside to see the 2 resident seals. They were hard to spot and it was actually Loki that clocked them first (we were all looking in the wrong section!) he called them “dogs” which was rather appropriate as it’s one of their nicknames. We were outside for feeding time a little later on and hilariously a naughty seagull kept stealing the fish that the Keeper was throwing for the seals! There was plenty of space on the viewing platform for the seals and the fence panels were clear so even Loki could see, which was fab. After the seals we wandered upstairs to a big open tank that had small sharks in and some stingrays. Loki chased random fish up and down following them through the glass, there was a smaller set of stairs where you could go up and look down and over the tank, which Edward really liked. Oren quickly bypassed this tank and went straight for the Meerkats! The boy has got quite a thing for Meerkats at the moment and there were roughly 20 to keep him occupied. Mark and I took turns chasing after Loki while Oren sat totally besotted with the Meerkats! Up the stairs again and there were lots of reptiles and a tank full of clown fish. (we found Nemo!) The boys could go inside this tank via a tunnel underneath and get a closer look. All 3 of them just about fit but I’m not sure they will for much longer! Edward was very surprised to see snakes, especially a rather big one! We went to the pet handling session and Oren chose to hold a smaller snake, which was bright orange. He couldn’t believe how soft it was nor how strong when it tried to slither round his arm! The Keeper also got a big tortoise out for us to see and everyone was amazed how quickly it moved. The shell was covered in beautiful markings and Edward had a wee stroke this time too. Loki ended up getting dragged out of the way because he tried to sit on it! I personally liked the water dragons and the big iguanas, they were a lot of fun trying to count and spot. The iguanas were basking under heat lamps munching away quite happily, quite envious actually as it was pretty miserable weather that day! There was another outdoor section at the top of the aquarium, 4 wee penguins! I’d missed them completely when I snooped online so they were an unexpected delight. I was pleased to find our Holztiger penguin in the change bag which Loki brandished quite proudly at them. They were all huddled together at the back of their enclosure so we didn’t really get a good look at them. Edward is now asking if we can go see penguins somewhere else! I think Edinburgh Zoo might be a good idea later on in the year. We then walked through the obligatory gift shop and stopped in the cafe to have lunch. It was well priced, clean and the service was friendly and quick. Edward was a bit quiet (we thought he was just hungry) but it turns out he’d seen plastic straws on the table and got really upset. He thought that the Aquarium didn’t really care about the oceans after all. He mentioned it at the end when we handed the quiz sheets back and as it turns out they weren’t plastic straws at all. They are in fact rejected potatoes and are both biodegradable and sustainably made! Such a delight to discover this, it’s nice to see a place follow through in it’s commitment to reducing plastic. Edward was so happy when I told him! After another jaunt on the beach collecting sea glass and doing some rock climbing I managed to get a new favourite photo of my boys. Mark is not entirely happy to be there and just wanted to head home, Edward is pulling a face, Loki is clinging onto the epically high 2 foot wall (it would appear heights are not his thing) and Oren was dancing and loving his life but unfortunately facing the wrong way! I’m getting this one framed! 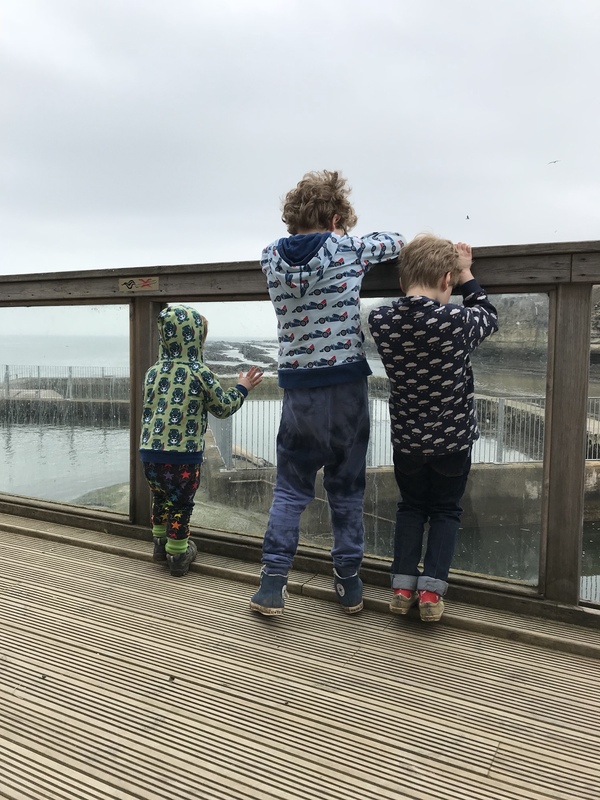 We’ll definitely be back on a rainy day in the summer holidays and thanks to the friendly set up and layout I fancy my chances taking the 3 boys on my own, which is even better!